Avoid London's rush hour as both transport methods are used by locals to move around the city. We are comparing Emirates Airline Cable Car and Thames River Cruise Prices from leading ticket suppliers and Try to find you Cheap tickets prices on the market. This combo ticket focuses on the River Thames in London allowing you to travel on the Thames and above it! The Emirates Airlines Cable Car takes visitors across the river giving them a birds eye view of the O2 Arena, Queen Elizabeth Olympic Park and the London skyline plus river. 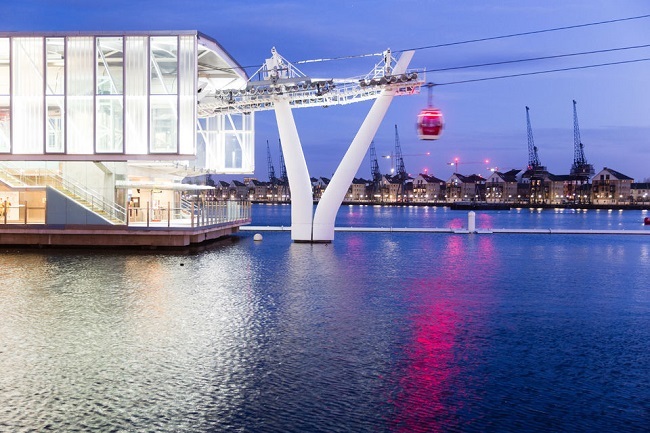 Built especially for the 2012 London Olympic Games, the Emirates Airline Cable Car ticket (return journey) includes an in-flight discovery film, souvenir in-flight guide and entry to Emirates Aviation Experience. The Thames Clippers River Rover ticket allows you unlimited 1 day hop-on-hop-off travel between 16 piers in the city as you take in all the key iconic London sights from the water. This particular cruise line has the fastest and most frequent fleet of river boats in London allowing travellers to move between London's most iconic riverside sights quickly and easily. A fantastic way to explore the Thames as you travel on it and across it. The Thames Clippers River Roamer company has the fastest and most frequent river boats, ideal for travellers who are limited on time. A fun day for everyone who wants to sightsee London and admire the best city views. Your Experience With Emirates Airline Cable Car and Thames River Cruise? With this combo ticket you'll be able to see the city of London and the River Thames like never before. The Emirates Airline Cable Car takes you 90 metres high on a 1km journey crossing one side of the river to the other with breathtaking a birds eye view of the O2 Arena, Queen Elizabeth Olympic Park and the overall London skyline. The cable car ticket includes an in-flight discovery film, souvenir in-flight guide and entry to Emirates Aviation Experience. There's no set order in which to do things but presuming you've just come down from the cable car, you can now hop-on the river cruise and make your way across the city on the water as you pass London's most iconic sights including Big Ben, The Shard, The Globe Theatre, Tower Bridge and so much more. The boat stops at 16 piers allowing you to hop off wherever you want to see more of the city. What Emirates Airline Cable Car and Thames River Cruise Includes? 1 day access to unlimited hop-on-hop-off travel on the Thames Clippers River Roamer boats. Don't travel during the holidays as the boat service is limited. Read your booking confirmation carefully to ensure a smooth trip, pay particular attention to routes and claiming your ticket. Travelers Reviews about Emirates Airline Cable Car and Thames River Cruise? Despite not having many reviews yet, this combo ticket gets mostly good reviews from travellers talking about it on Viator, Get Your Guide, and Trip Advisor. They say "Great way to see the city without using the tube! ", "Very Enjoyable", "Something Different", and "Very Good, Would Do It Again". Complaints only occur due to misunderstandings about tickets (you must exchange your voucher for a ticket at the designated Thames Clippers ticket offices) and due to limited services on holidays. All travellers agree that these two methods of transport are a great way to see the city and admire the views. Note that boat tickets are only valid for the piers in the central and eastern zones and are not valid on the RB6 route westbound route. Remember to print your ticket - E-tickets are not accepted onboard. You must collect your combo ticket from the ticket offices located at Westminster, Embankment, London Bridge, Tower, Greenwich or North Greenwich piers. Departure points are: Westminster Pier, Embankment Pier, London Bridge City Pier, Tower Pier, Greenwich Pier or North Greenwich Pier.